8 years and 2 additional CDs later, Jimmy and I still have a great relationship and I listen to them often. I’ve seen them in concert and I know exactly what songs will go with my current mood, which songs will cheer me up, which songs I can sing out loud and dance around to. If you already love Jimmy Eat World, good for you! If you haven’t really listened to them a whole lot- let me help you out! I made you a playlist! 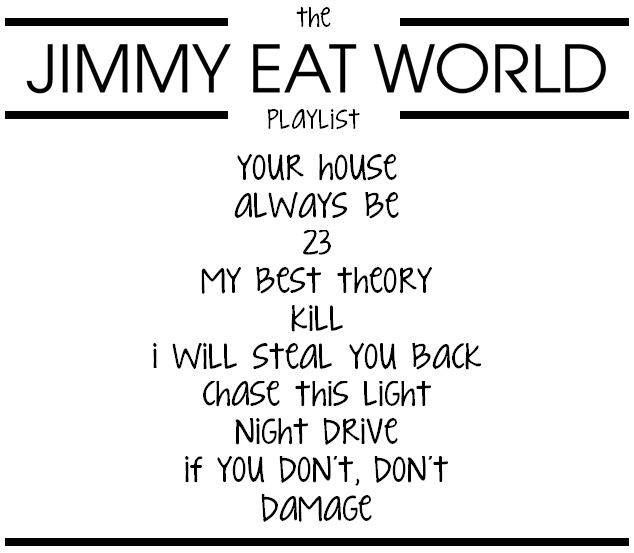 Below are 10 of my very favorite songs from Jimmy Eat World. Scroll the the bottom and push play to listen to them! Enjoy! Thanks for sharing, Katie. I didn’t know about this group. I’m kinda clueless about most music genres.